The 8′ x 8′ Traditional Sun Pent 8′ Gable Shed has a really impressive and stand out look that is going to make it the highlight of your garden. This is a shed that is made for people who love to garden and grow their own plants and vegetables. The front of the shed has a vast array of high quality, horticultural glass windows that allow lots of sunlight into the shed. To get the best out of these windows, a full length bench is included that sits right under them, ensuring whatever you place on here gets exposed to a lot of light. On each side there is another set of windows, two of these can actually be opened so you can get fresh air in the shed. In all this is just a fantastic looking shed that is also very practical. Despite having a very friendly and charming look to it, this is a shed that is also very robust and is going to last you a long time. The walls are made with tongue and groove shiplap cladding and then supported with a very impressive frame. The floor is able to take a lot of weight without buckling thanks to being made with top quality, tongue and groove boards. To stop the rain pouring in, we have a well designed pent roof that is made with the same style of boards as the floor and then covered with very impressive felt. 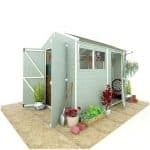 With the 8′ x 8′ Traditional Sun Pent 8′ Gable Shed, you not only have a truly gorgeous place to organise your rakes, hoes, mower and other such gardening items and tools. You also have a place where you can put plants and vegetables so they can grow and keep out of the rain. We really love the design of this shed and as well as the storage space it has a fantastic little bench right in front of the windows so you can make sure the things that need sunlight can get it. The width and the depth of the shed is 8 feet in size, but with that extra shelf, you do have a little extra storage space. 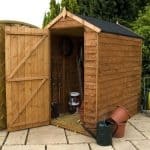 This is a very reasonably sized shed when it comes to its height with the high point being 6 feet 6 inches high and the low point is 5 feet 9 inches. Putting a set of shelves in here and using that height would be a great way to free up some floor space. The pent roof on top of the shed has been made very well and it certainly adds to the overall charm of the shed. Made with 12 mm tongue and groove boards this is one very strong roof that is kept safe from the elements thanks to the heavy duty felt that is on here. One thing that Treetops Traditional have managed to do very well here is make this a shed that is just ideal for people who love gardening, but they have given it a very modern style so that it still has a cool and stylish look to it. This is done by using the same type of smooth, 12 mm thick tongue and groove shiplap cladding that they use on their other sheds. As well as the amazing look it is also very efficient at keeping out the rain thanks to their being no way for water to get inside. This series of sheds is every bit as strong as the other sheds from Treetops Traditional thanks to them using their very robust, 44 mm x 27 mm frame. This has quite a different look from their other sheds so to be honest, we had no idea if they would use their standard and very well designed frame so it was a pleasant surprise to find out that they have. This frame is going to ensure you can use this shed for a lot of years. 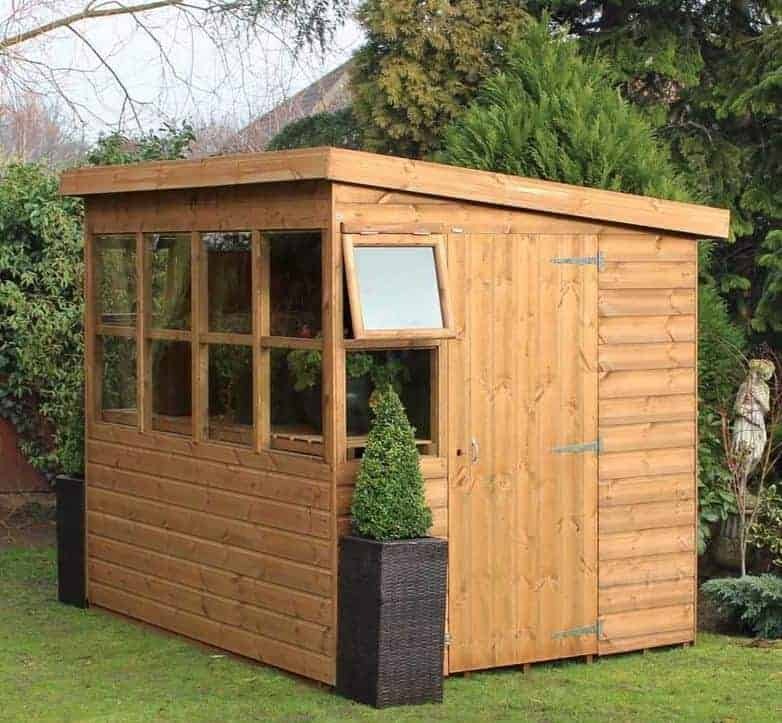 We have a feeling that people who buy this shed are going to be spending quite a bit of time in here and also are going to be putting some heavy things like big bags of plant food and other such gardening items inside. That is no problem at all as the floor is made with 12 mm thick tongue and groove boarding so it can take a lot of weight. You could probably store that giant man eating plant from Little Shop Of Horrors in here and the floor could take his weight, he may eat you, but the floor could still take his weight. All of the wood on here is high quality red wood and it will get a free dip treatment before it is sent your way. This is only a short term form of protection and once installed, you will need to give it a coating of wood treatment to keep it rot free. A fresh coating once a year is going to ensure that wood stays looking smooth for the duration of the sheds life. The 8′ x 8′ Traditional Sun Pent 8′ Gable Shed comes with a one year guarantee that will look after you in case of rot and any other issue the shed may have. As you can see from the pictures there is a great looking door on this shed. The one pictured is the standard door, but you can ask for a stable style door to be included instead. No matter what style of door you go for, it is going to be wide and high enough so that getting large items in is not going to cause you any headaches. Also to stop the door from sagging as time passes by, heavy duty hinges have been used to keep it where it should be. The first thing most people notice about this shed is that impressive set of windows that take up nearly half of the front of the shed. These are incredible and right on the front we have 8 fixed horticultural glass windows. These are positioned right in front of that shelf so this is certainly the spot you want to place your plants or food you are trying to grow. There are two more windows on the shed with there being one on each side. What is good about these ones is that two of them actual open so you can let in fresh air. This has a very solid design and the door has a lock on it so you can keep your items locked up securely. Adding other security measures like a padlock would be relatively easy to do if you did want to increase the security a little bit. In total there are 12 windows on this shed so as you would expect it really is not offering much when it comes to privacy. To be fair though this is not a problem as the idea of this shed is that it lets in lots of natural light to help things grow. Treetops Traditional are usually great when it comes to letting you tinker with the design of their sheds and this one here is no different. The door can be placed on either side of the shed so you can place it where it will be most convenient for you. Also you can give that smooth looking wood a little bit more character by using a coloured wood treatment. If you want to give the floor some extra support and raise it of the ground a little bit more, then they do offer a set of wooden floor bearers. These can be added as an extra for a cost of, £43.99 which we feel is a reasonable price. They also have an installation service where if you pay an extra, £134.99, the shed will be installed once it has been delivered. This is a shed that really is high quality in every way and we think that Treetops Traditional really have done an amazing job here. 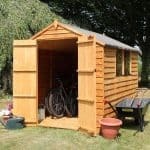 The materials used in making this shed are just great and will easily last 20 or more years. 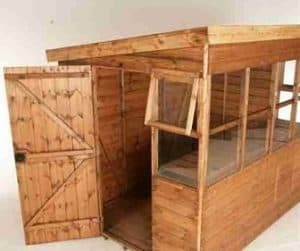 This is not the largest shed, but you do have that extra bench and the height does allow you to store things rather high so you will have plenty of room to play with inside of here. 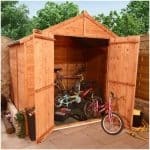 3-6 hours is the usual build time for a shed like this, but we feel that this is the kind of DIY job that you and the friend you have sweet talked into helping you will have a lot of fun with. 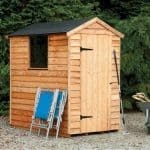 This is quite an expensive shed and it is considerably more expensive than the model that is slightly smaller. But at the end of the day this is a very well made shed and it does look just incredible. Final Thoughts: This is one very impressive shed that we think is actually one of the most attractive looking designs, Treetops Traditional have done. The 8' x 8' Traditional Sun Pent 8' Gable Shed is offering just what all people who want to grow their own vegetables and take care of their plants want and that is a lot of natural sunlight and a decent amount of storage space. 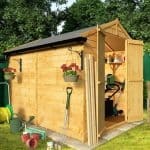 While we do love the way the shed looks, we do have to question the price a little bit, but at the end of the day this is a shed that is going to last you easily at least two decades so in that regard considering how much use you are going to get out of it the price does start to seem more fair.